As a student of Foucault and Sartre, I’ve been trained to look at objects, events, and decisions as fragments of places: the here and there. I remember the first time my university professor John Ricco explained this singularity. Seeing the other as a place, as a moment in time. This way of perceiving the world has changed every facet of my life. When rowing, either on the water or on a machine, the goal becomes a place. When dealing with a difficult decision, I imagine 2 subway stops, the here and there. In between lies nothing but discomfort. It is, after all, the unknown; a dark abyss of cause and relation. When playing music, cadence and rhythm struggle through dissonance only to reveal paradise –a place where sounds are perfect, and weightless emotions come as easy as breathing. The first time I was consumed by the here and there was with the work of Felix Gonzalez Torres. The Absent Body portrays an image of an empty bed, visible with the imprints of two bodies that had laid there. What we see is the there, where is the here? Who are the here? What narrative could be forming outside of this frame? What is the space between the here and there? In my mind, Gonzalez Torres expertly depicted the nuances of fragments of space captured in time. I have looked at this piece of art for hours, mending spaces, finding cause and relation, seeing the unknown. It is uncomfortable as it is pleasurable. 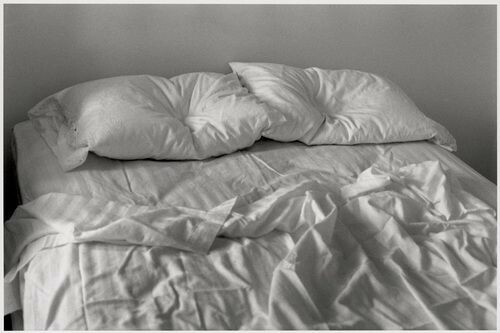 When real life kicks in and I’m invited to see fragments of spaces in my own life, I visualize that bed. I see the moments that were, that are, and that could be. Three distinct shapes, joined together only by their distance. I’m compelled to see the practice of Design as just this –fragments of spaces, the here and there. Design is tasked with providing a clear connection between these pieces of spatial matter. Adopting a spatial conceptual model could yield a more coherent design solution. The difference being that this conceptual model is tied to narrative as much as it is linked to engagement. As a Designer, achieve this by approaching each project, feature, and incremental enhancement as a piece of art: look at it with intent. Understand and craft a narrative of the here and there. What is? What was? What could be? Lead users towards a unification of these moments in space. If you observe closely, you might find these distinct places often manifest in the User Experience journey as user needs. This is because our users are looking for a story; a narrative they can understand and appreciate as their own. Our minds work in peculiar ways. We navigate this world of chaos by understanding their place in the context of our story. Every single one of us has a story. Words we say, words we live by, words that were imparted to us by our mothers and grandfathers. We clumsily journey through the here in order to predict the there a little bit better. As Designers, we all can apply unique foresight of narratives to solve some of our world’s toughest, wicked problems. That’s the beauty of User Experience, and even life itself; each solution is as unique as the problem itself. As always, one question is all it takes to get started. What’s your story? Senior Product Designer at Shopify. Teacher. Rower. Interested in culture, design, aesthetic, wit, reality, thought, and the happiness of pursuit.